WE ARE ALWAYS WILLING AND AVAILABLE TO ANSWER YOUR TECH QUESTIONS AND HELP YOU WITH INSTALLATION PROBLEMS. FEEL FREE TO CALL. THIS PAGE COVERS A FEW OF THE BASICS OF VW TRANSAXLE INSTALLATION. WE HOPE IT IS HELPFUL. NOTE: FOR A BETTER VIEW OF ANY PICTURE, JUST CLICK ON THE PICTURE OF YOUR CHOICE. 1): MAKE SURE THAT FRONT AND REAR MOUNTS ARE IN GOOD CONDITION. IF THE RUBBER IS SEPARATING FROM THE METAL AT ALL OR IF THEY ARE SOFT AND SPONGY, REPLACE THEM. BROKEN, LOOSE, OR OVERLY SPONGY MOUNTS CAN CAUSE YOUR TRANSAXLE TO POP OUT OF GEAR, BE DIFFICULT TO SHIFT, OR THE NOSE CONE MAY BREAK. 2): BOLT THE FRONT MOUNT SECURELY TO THE NOSE CONE. 3): GET ALL OF THE NUTS AND BOLTS FOR THE REAR MOUNT BRACKET STARTED; ONE OR TWO THREADS. 4): TIGHTEN THE 4 MOUNTING NUTS INSIDE THE BELL HOUSING. 5): IF IT IS AN IRS TRANSAXLE, PLACE IT ON LEVEL GROUND AND FILL IT WITH GEAR OIL. FILL IT TO THE BOTTOM OF THE OIL FILL HOLE. WAIT ABOUT TEN MINUTES FOR THE OIL TO FLOW INTO THE VARIOUS COMPARTMENTS WITHIN THE CASE AND TOP IT OFF AGAIN. FOR SWING AXLE TRANSAXLES, WAIT UNTIL THE TRANSAXLE IS COMPLETELY INSTALLED, 'THE CAR IS ON LEVEL GROUND, AND THE BRAKE DRUMS ARE INSTALLED AND TORQUED BEFORE ADDING OIL, THEN FOLLOW THE SAME PROCEDURE. 6): SLIDE THE TRANSAXLE INTO POSITION IN THE PAN AND START THE FRONT MOUNT NUTS (ONE OR TWO THREADS). 7): INSTALL AND TORQUE THE 2 HORN BOLTS (27MM WRENCH SIZE). 8): TIGHTEN THE FRONT MOUNT NUTS SECURELY. 9): TIGHTEN THE REAR MOUNT TO MOUNTING BRACKET NUTS. 10): ON AN IRS TRANSAXLE YOU ARE NOW READY TO BOLT UP THE CV JOINTS. IF YOU ARE NOT CLEANING AND RE-PACKING THE CV JOINTS AT LEAST REPLACE THE GREASE THAT WAS LOST DURING DISASSEMBLY. USE ONLY A MOLY-BASED GREASE INTENDED FOR THIS PURPOSE. ON A SWING AXLE APPLICATION YOU ARE NOW READY TO BOLT THE SPRING PLATES TO THE AXLE TUBE END CASTINGS. 11): INSTALL THE GROUND STRAP, PLUG IN THE BACKUP LIGHT SWITCH, IF SO EQUIPPED, AND INSTALL THE THROWOUT BEARING. 12): CONNECT THE SHIFT COUPLER TO THE TRANSAXLE SHIFT SHAFT. INSPECT YOUR COUPLER FOR WORN BUSHINGS AND DISTORTION. REPLACE IT IF NECESSARY. 13): INSTALL THE CLUTCH CABLE BOWDEN TUBE. IT SHOULD HAVE A NICE TIGHT ARC, WITH NO PLAY AT EITHER END. IF IT HAS PLAY OR IS LOOSE, YOU WILL NEED TO SHIM IT WITH WASHERS AT THE TRANSAXLE SIDE COVER. START THE THREADS ON THE CLUTCH ADJUSTMENT NUT. CLUTCH FREE PLAY ADJUSTMENT MUST BE MADE AFTER THE ENGINE IS INSTALLED. YOU MUST HAVE A LITTLE FREE PLAY BEFORE THE THROWOUT BEARING CONTACTS THE PRESSURE PLATE, OR YOUR THROWOUT BEARING WILL ONLY LAST A FEW DAYS, RATHER THAN SEVERAL YEARS. THE MOST COMMON MISTAKE IN THIS OPERATION IS TO TIGHTEN THE REAR MOUNTING BRACKET BOLTS BEFORE THE FRONT MOUNT IS TIGHTENED. PEOPLE TEND TO DO IT THIS WAY AND THEN GO TO THE FRONT MOUNT LAST, ONLY TO FIND THAT IT IS 1/4" OR MORE AWAY FROM THE PAN. THEY THEN GET THE NUTS STARTED AND TIGHTEN THEM, PULLING THE TRANSAXLE INTO POSITION. THIS WILL SEVERELY WARP YOUR NOSE CONE AND CAUSE THE TRANSAXLE TO BE IN A STRESSED SITUATION, ESPECIALLY WHEN USING URETHANE OR SOLID MOUNTS. THIS CAN CAUSE NOSE CONE OR CASE BREAKAGE. IN A MID-ENGINE APPLICATION IT MAY BE NECESSARY TO INSTALL SPACERS OR WASHERS TO AVOID "STRETCHING THE NOSE CONE INTO PLACE". 1): APPLY SEALER TO ONE SIDE OF AN AXLE FLANGE GASKET AND PLACE GASKET ON SIDE COVER, SEALANT SIDE DOWN. THEN PLACE TWO MORE GASKETS ON THE SIDE COVER. INSTALL THE PLASTIC BUSHING. 2): BOLT THE AXLE TUBE TO THE SIDE COVER AND CHECK THE CLEARANCE. THE TUBE SHOULD MOVE FREELY THROUGHOUT IT'S RANGE OF TRAVEL WITHOUT EXCESSIVE FORCE OR BINDING. IF IT DOES, AND THERE IS NOT EXCESSIVE CLEARANCE, PROCEED TO STEP 3. (THERE IS EXCESSIVE CLEARANCE IF THE TUBE FALLS UNDER ITS OWN WEIGHT OR IF THERE IS ANY UP AND DOWN MOVEMENT BETWEEN THE TUBE AND THE SIDE COVER). IF THERE IS NOT ENOUGH CLEARANCE, (DIFFICULT OR IMPOSSIBLE TO MOVE TUBE), REMOVE THE TUBE, ADD A GASKET AND RE-CHECK CLEARANCE. IF THERE IS TOO MUCH CLEARANCE REMOVE THE TUBE, REMOVE A GASKET, AND RE-CHECK CLEARANCE. REPEAT THESE STEPS UNTIL CLEARANCE IS CORRECT. IF YOU HAVE ONLY ONE GASKET INSTALLED AND THERE IS STILL TOO MUCH CLEARANCE YOU HAVE AN EXCESSIVELY WORN AXLE TUBE FLANGE AND MUST REPLACE IT. ONCE CORRECT CLEARANCE IS ESTABLISHED PROCEED TO STEP 3. 3): REMOVE THE AXLE TUBE AND PLASTIC BUSHING. 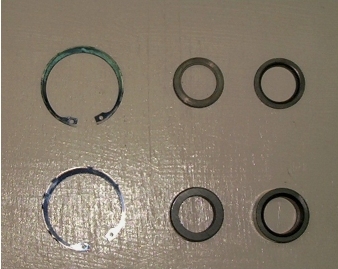 REMOVE THE GASKETS, EXCEPT FOR THE FIRST ONE WITH SEALANT APPLIED. APPLY TRANSMISSION ASSEMBLY GREASE (WHEEL BEARING GREASE WILL DO) TO THE FULCRUM PLATES AND INSTALL THE FULCRUM PLATES IN THE SIDE GEARS. AT THIS POINT WE RECOMMEND THAT YOU HAVE THE TRANSAXLE IN A HORIZONTAL POSITION. THE AXLE AND TUBE SHOULD BE INSTALLED VERTICALLY. INSTALLING THE TRANSMISSION CASE INTO AN ENGINE STAND AND ROTATING TO A HORIZONTAL POSITION WILL ACCOMPLISH THIS. INSTALL THE AXLE INTO THE SIDE GEAR, MOVING THE FULCRUM PLATES INTO POSITION AS REQUIRED. 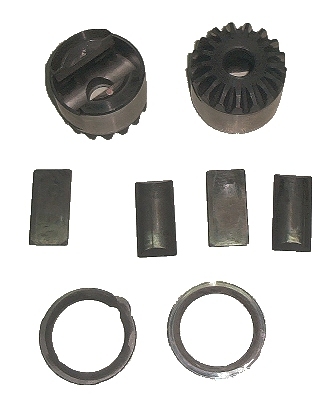 APPLY TRANSMISSION ASSEMBLY GREASE TO THE INSIDE OF THE DIFFERENTIAL CARRIER AND TO THE SIDE GEAR TEETH. INSTALL THE AXLE, SIDE GEAR, AND FULCRUM PLATES AS AN ASSEMBLY INTO THE DIFFERENTIAL CARRIER. THIS SHOULD BE DONE VERTICALLY. SOMETIMES YOU WILL ENCOUNTER A BURR AT THE BOTTOM OF THE SNAP RING GROOVE, ESPECIALLY WITH A NEW SUPER-DIFF. TAPPING LIGHTLY ON THE END OF THE AXLE WITH A PLASTIC MALLET WILL PUSH THE SIDE GEAR PAST THIS BURR. MAKE SURE THE SIDE GEAR IS FULLY ENGAGED WITH THE SPIDER GEARS AND TURNS FREELY. NEXT INSTALL THE THRUST WASHER. MAKE SURE THAT IT DROPS IN WITHOUT INTERFERENCE WITH THE DIFFERENTIAL CARRIER. SOMETIMES WITH AFTERMARKET SUPER-DIFFS IT IS NECESSARY TO GRIND THE SIDE OF THE THRUST WASHER FOR PROPER CLEARANCE AND THEN REMOVE ANY BURRS FROM THE SURFACE WITH A FILE. SEE BELOW. NEXT INSTALL THE SNAP RING, MAKING SURE IT IS FULLY SEATED IN THE GROOVE. 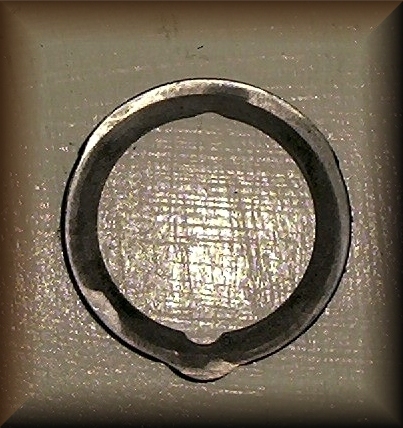 AFTER THE SNAP RING IS INSTALLED, MAKE SURE THE THRUST WASHER MOVES FREELY UNDER THE SNAP RING. THERE SHOULDN'T BE ANY UP AND DOWN PLAY PER SE, BUT THE THRUST WASHER MUST NOT BE IN A BIND. IF IT IS, IT WILL BE NECESSARY TO REMOVE THE SIDE GEAR AND SURFACE ABOUT .002” OFF OF THE SURFACE THAT CONTACTS THE THRUST WASHER THIS IS OFTEN NECESSARY WHEN USING AFTERMARKET SUPER-DIFFS. WHEN YOU HAVE PROPER SIDE GEAR TO THRUST WASHER CLEARANCE YOU ARE READY TO MOVE ON TO STEP 4. 4): APPLY SEALER TO AS MANY GASKETS AS YOU USED IN THE TRIAL ASSEMBLY AND PLACE THEM ON THE SIDE COVER. INSTALL THE PLASTIC BUSHING. APPLY A THIN BEAD OF SILICONE SEALER TO THE AXLE TUBE FLANGE ON THE EDGE AND INSTALL THE AXLE TUBE ASSEMBLY TO THE SIDE COVER. USE LOCK WASHERS OR NYLOCK NUTS AND TIGHTEN THEM. 5): INSTALL THE INTERNAL SPACER OVER THE AXLE WITH THE CONCAVE SIDE DOWN. SLIDE THE AXLE BEARING OVER THE AXLE AND DRIVE IT ONTO THE AXLE AND INTO THE END CASTING WITH A PIECE OF TUBING. IF YOU ARE INSTALLING YOUR BRAKES NOW YOU SHOULD SKIP AHEAD TO THE BRAKE SECTION. IF NOT, WIRE THE BEARING SECURELY INTO THE END CASTING UNTIL YOU ARE READY TO INSTALL THE BRAKES. IF THE AXLE BEARING IS ALLOWED TO SLIP OUT OF THE END CASTING THE FULCRUM PLATES MAY SLIP OUT OF POSITION AND GET BEHIND THE AXLE. THIS WILL DESTROY YOUR DIFFERENTIAL AS SOON AS YOU DRIVE THE CAR. 6): ROTATE THE TRANSAXLE 180 DEGREES AND REPEAT STEP 5. DO NOT BE ALARMED IF THE AXLES BIND AND DO NOT TURN WELL. THE AXLES NEED TO BE PULLED ALL THE WAY THROUGH THE BEARINGS BEFORE THE SIDE GEARS AND SPIDER GEARS WILL HAVE PROPER CLEARANCE. THIS WILL HAPPEN WHEN THE BRAKE DRUMS ARE TORQUED. 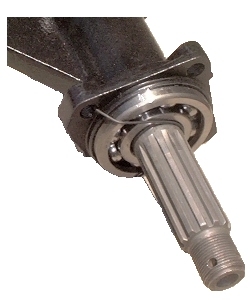 7): IF YOU ARE INSTALLING THE BRAKES AFTER THE TRANSAXLE IS INSTALLED INTO THE CAR, YOU ARE NOW READY FOR INSTALLATION. THIS IS USUALLY THE EASIEST WAY, BECAUSE IF YOUR BRAKES DO NOT NEED TO BE OVERHAULED YOU CAN LEAVE THEM ATTACHED TO THE BACKING PLATES WHEN REMOVING THE TRANSAXLE FROM THE CAR. THIS WAY YOU WILL NOT HAVE TO BLEED THEM. 8): BRAKES: YOU WILL NEED A PAIR OF AXLE SEAL KITS TO INSTALL THE BRAKES. 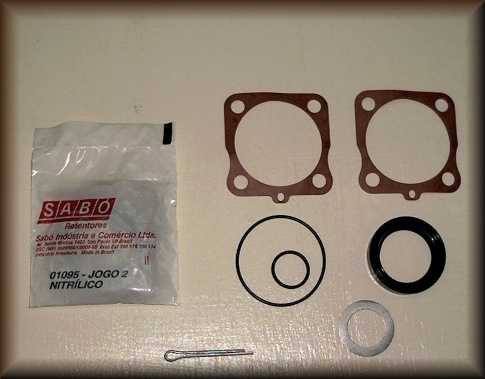 THE KIT CONSISTS OF TWO GASKETS, ONE METAL SHIM, TWO "O" RINGS, A SEAL, AND A COTTER PIN. FIRST REMOVE THE OLD SEAL AND THOROUGHLY CLEAN THE BEARING FLANGE, REMOVING ALL OLD GASKET MATERIAL. INSTALL THE NEW SEAL IN THE FLANGE, USING ASSEMBLY GREASE ON THE INNER AND OUTER EDGES. 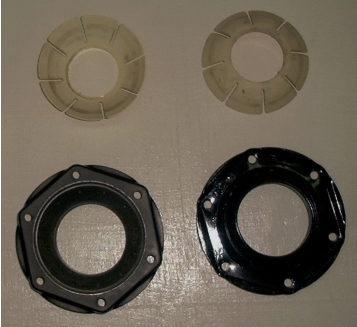 INSTALL THE OUTER SPACER/SEAL RACE INTO THE FLANGE, WITH THE INNER BEVELED EDGE TOWARD THE AXLE TUBE. NEXT INSTALL THE SHIM ONTO THE AXLE. THESE SHIMS USUALLY HAVE ONE SMOOTHER SIDE. PLACE THE ROUGH SIDE DOWN. APPLY ASSEMBLY GREASE TO THE SMALL "O" RING AND INSTALL IT ONTO THE AXLE, UP AGAINST THE SHIM. 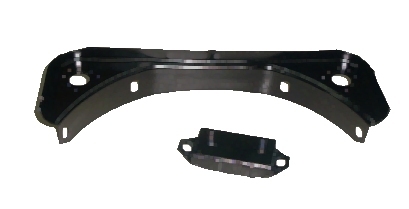 THE SEAL KITS COME WITH TWO GASKETS BECAUSE THE SWING AXLE BUS USES ONE BEHIND AND ONE ON TOP OF THE BACKING PLATE. THE TYPE I ONLY USES ONE. INSTALL THE BACKING PLATE AGAINST THE END CASTING. APPLY SEALER TO THE GASKET AND INSTALL IT AGAINST THE BACKING PLATE. 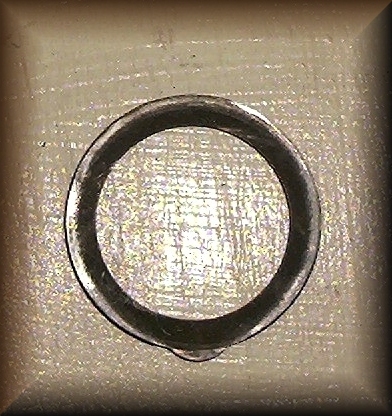 INSTALL THE LARGE "O”RING AROUND THE EDGE OF THE BEARING. APPLY A THIN LAYER OF SILICONE SEALER TO THE INNER BEVELED EDGE OF THE BEARING FLANGE AND CAREFULLY SLIDE THE FLANGE ONTO THE AXLE WITH THE SEAL RACE INSIDE. BOLT THE FLANGE SECURELY TO THE END CASTING, MAKING SURE THAT THE GASKET DOESN'T SPLIT AND THE "O" RING DOESN'T SQUEEZE OUT FROM UNDERNEATH THE FLANGE. 9): IF YOU ARE SATISFIED WITH THE CONDITION OF YOUR BRAKE SHOES, WHEEL CYLINDERS AND HARDWARE, YOU ARE NOW READY TO INSTALL THE DRUMS. YOU MAY HAVE TO BACK OFF THE BRAKE ADJUSTMENT TO GET THE DRUMS ON, AND THEN RE-ADJUST THEM LATER. SLIDE THE DRUMS ONTO THE AXLES, INSTALL THE AXLE NUT, AND TORQUE IT TO 270 FT. LBS. THIS IS MOST EASILY ACCOMPLISHED WITH A QUALITY 1/2" AIR IMPACT DRIVER AND 150PSI OF AIR PRESSURE. IF SUCH A TOOL IS NOT AVAILABLE, YOU MAY USE A TORQUE MULTIPLIER, A 1/2" BREAKER BAR, AND A LONG "CHEATER BAR". YOU WILL HAVE TO HAVE SOMEONE STAND ON THE BRAKES TO ACCOMPLISH THIS. IT IS VERY IMPORTANT TO GET ENOUGH TORQUE ON THE AXLE NUTS, AS YOUR DRUMS WILL STRIP THEIR SPLINES IF YOU DON'T. INSTALL THE COTTER PINS AFTER THE DRUMS ARE TORQUED. HOPEFULLY THIS SECTION WILL BE OF HELP TO YOU WHETHER YOU PURCHASE ONE OF OUR REBUILT UNITS OR NOT. PLEASE FEEL FREE TO CALL WITH ANY QUESTIONS YOU MAY HAVE.